If you’re a day trader you might want to tread carefully the next couple of days. That’s because Bitcoin has once again been moving sideways. Not only that, but the last swing was lower than the previous which just barely managed to touch the resistance formed on April the 3rd. Coupled by the fact that both the Relative Strength Index and Stochastics on the daily are in the extreme to insane overbought range, we’re bound to see some type of retracement soon enough. In the next couple of days we will most likely see the retracement towards $5100 and if my calculations are correct we should crash through it quite easily. When this happens the next target would be $4500-ish. Which if you ask me is a good price to buy some more Bitcoins as we are gradually moving towards the next All Time High. But let’s not get ahead of ourselves. First we need a flash crash. Let’s get started! By the way, did you notice the shooting star on the daily? I didn’t post a screenshot here, but it’s there alright. 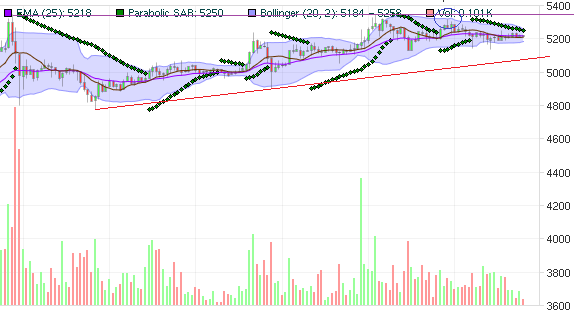 Bitcoin failed to break through the resistance it formed. I wonder what that means? Can you figure it out?